The performers Leja Jurišić and Teja Reba, who don't shy away from using urination as a creative tool, address the notions of public morals and freedom of expression, while putting body fluids on the throne of feminine performativity. 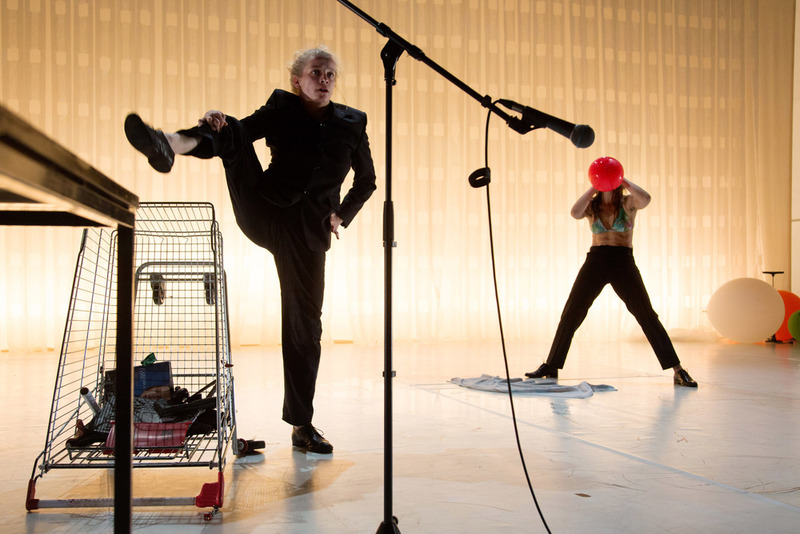 In The Second Freedom, the two performers test the limits of freedom of speech and morality. Leaving spectators bewildered in their astonishment, Jurišić and Reba cross the lines between what should and what shouldn’t be done on stage with an ease of seductive iconoclasts. We see a dissolution of the boundary between performers’ private and public realm, while wondering whether it is allowed to literally piss on words in order to make a particular thought, scene, or material work. We are submerged in perceptions of secretion as something desirable and of utter importance in interrogating the boundaries of prohibition. Straightforward and bold, Jurišić and Reba have no hesitations. Avoiding the use of conventional ways of (patriarchal) politics and promoting a female (not necessarily feminist) perspective without caring one iota about whether or not this comes across as adequate, the Second Freedom confronts social consensuses and treats authorities as completely obsolete.